The 1970's were a wondrous time for horror. Populated mostly by serial killers and maniacs, there are also a fair amount of demons, devils, spirits, and other such malicious, supernatural entities. Tonight's movie falls into this latter category. If The Exorcist and The Omen had a VERY boring baby, it would be Audrey Rose. There's something so soap-opera-ish about this movie's plot; the story just doesn't seem to go anywhere and when it does, it doesn't make any sense. The gist? A family loses a child. The father seeks comfort in meditation and comes to believe his daughter has been reincarnated in another little girl. He approaches the girl's family, tells them this whacky theory, and all hell breaks loose. The man's story is so absurd that the family seeks the help of a lawyer - as though "crazy talk" is some sort of arrestable or prosecutable offense. The lawyer decides that he should invent some questions for the family to ask and that he'll hide in their house and "just listen" while they get the man's answers. He promises to be their witness. To what end? At this point, the story truly spirals into the toilet and completely loses ANY focus it may have had. I imagine that, at the time it was made, director Robert Wise was the biggest possible draw for people to watch this wandering, pointless movie. Or perhaps it was appealing for another reason. Do a little digging and you'll find some interesting stuff written in defense of Audrey Rose. I'm not the first critic to accuse it of being a pretty obvious rip off of The Exorcist. There is some argument to the contrary, that says during the 60's and 70's Americans had a cultural obsession with Eastern religions, thus bits and pieces of that mythology (reincarnation in particular) really began to find it's way into our movies. 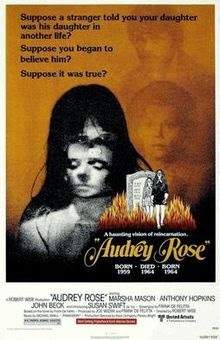 For the laymen among us, that means Audrey Rose and The Exorcist are actually two peas in a sub-genre pod. Now, Anthony Hopkins is probably the only reason anyone will go back and watch this movie. Which is actually funny to me because, as much as there is a perception that he is an amazing actor, he's prone to this theatrical, over-dramatization that leaves him munching contentedly on scenery much of the time. If ever there were a case of him ridiculously overacting, aside from the Wolfman remake, it would be this movie.